If you’re a living, breathing human being with hopes and dreams, chances are you regularly salivate over the thought of pizza. The majority of pies you’ve consumed were delivered in a sweaty, cardboard box, or handed over a counter-top in exchange for hard currency. But with the Pizzacraft Pizzeria Pronto Stovetop Pizza Oven -- a small, portable contraption that fits right on your stove -- you are the master of your own pizza destiny -- a sorcerer of crusts, if you will. 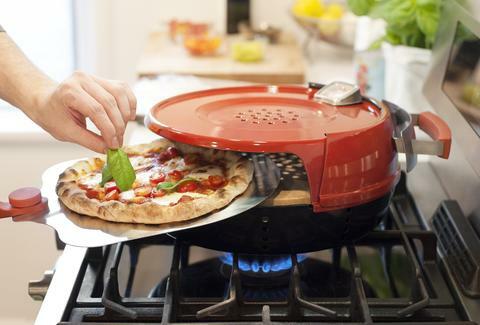 For starters, this thing works like a dream: It uses the gas burner on your stove, syphoning up flames and cooking your pizza at temperatures close to 600 degrees. With all of that heat, your pizza can be cooked in six minutes -- the equivalent of placing an order on Seamless. Compare that with the glacial pace of heating a pie in your conventional oven, or ordering from a massive chain and realizing that even though you look like an adult, you’re still reliant on habits you developed at age 12. Pizzacraft’s oven will jettison you into adulthood. Why? You have to make your own damn pizza, which is really no simple task, but the reward is a hot, flakey, gooey pie of your own design, which probably feels as it good as it tastes.